Over the years I’ve had my share of sellers object to a realistic listing price, and I wanted to share them with you. It’s important to remember that the listing price of the home is determined by a variety of factors, and that your first price should be your best price! 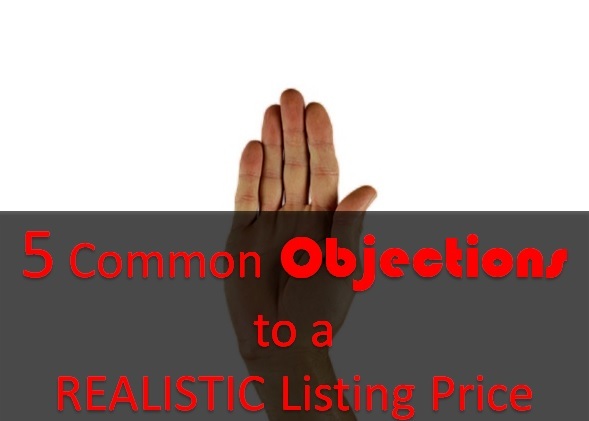 Here’s a look at common objections sellers have to an accurate listing price. When faced with a listing price that is lower than what they had hoped, sellers often feel like they are in fact giving their house away. While that is certainly not the case, sellers need to be reminded that their home is only worth what a buyer is willing to pay for it in the current real estate market conditions. This approach can be detrimental to the length of time a home will be on the market. Your first price should be the best and most accurate price. While it can be tempting to FSBO (for sale by owner) to save on paying out a Realtor’s commission, did you know that over 80% of the for sale by owner sellers end up hiring a Realtor anyway after unsuccessfully trying to sell on their own? That means time and money spent before starting the process over. Current market conditions will be the determining factor here. It doesn’t matter what you paid for your home, you’ll only be able to sell it for what a buyer is willing to pay for it. "I did a lot of upgrades in this home and that cost me a lot of money…"
This is the objection I dislike the most, only because my heart goes out to the seller who is so proud of the home improvements and upgrades they’ve made, without realizing they may not recoup the cost come selling time. It’s important to do the proper research to be able to avoid over-improving your home if you’ll be selling in the future. When you are ready to sell your home, give me a call for a free consultation. We will go over your goals and expectations and talk about how my services can help you.